Read the notes! 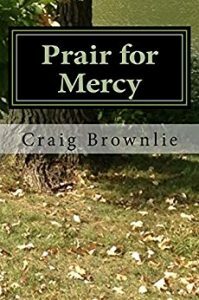 Buy Prair for Mercy! The concept of the private investigator as hero is inextricably entwined with the idea of the wandering knight as hero (or perhaps the Samurai Rōnin seeking redemption). Philip Marlowe and Sam Spade always seemed to enter the fray with an eye toward rescuing the helpless (or perhaps hapless). This idea of the knight errant had to evolve as the 20th century spread wide knowledge of crimes which could not be addressed by a lone man. Essentially, we all started to recognize the lie of the great man theory of history. Even so, we are each the protagonist of our own lives. We appreciate a little guidance, so we still want stories where one person overcomes the obstacles placed before him. When I started writing the second Morgan Prair book, I knew that I wanted him to face an insurmountable problem. Maybe I had been listening to too much news, but the weight of the world felt particularly heavy. I sought a way to crystallize all of those troubles into one challenge for Morgan. The death penalty was facing another one of its moments in the public discussion. I already had set Morgan up as a reluctant investigator. He seemed perfect as a stand-in for the disinterest most of us demonstrate when issues don’t affect us directly. Mumia Abu-Jamal held the public eye at the time as a symbol of the public conflict about the death penalty. His writing were published and accessible pre-Internet. Unlike those who defended or condemned him, I found his writings about the actual experience of living on death row quite informative. Moreover, he served in the very institution that would fit best with my narrative. I had less use for the polemics arising on all sides. They generally drive us all to disinterest (perhaps the desired outcome of those in favor of the status quo). The first book builds a world of characters around Morgan. While I was willing to leave behind the university library, Benton, Alicia, Tony, and all the rest continued to interest me. In a sense, they felt like a family, which got me thinking about where the book ought to go. Moreover, we moved from right beside the University of Pittsburgh to our first house, which was in the Bloomfield neighborhood. The realtor who drove me around one afternoon looking at houses had a great convertible and a penchant for blasting Sinatra. Every street prompted another story about what had gone down there when he was a kid. As you can tell from Prair for Mercy, I absorbed it all. Also, we bought the least expensive house he showed us. Hanging out with our new neighbors on the front stoop was a great experience. We seemed to be the newest blood within six blocks, measured in decades. Working in Pittsburgh also blessed us with the opportunity to explore the region with a little more mobility. The Mystery Lovers Bookstore west of the city presented a lot of contemporary writers in person; plus they always had good advice. I became enamored with the writings of Jannwillem van de Wetering. His mysteries are great, but he also wrote memoirs about his experiences with Zen Buddhism. So, that’s how Zen enters the equation for Prair for Mercy– as an idea about coping with that weight of the world.